Services - Plastic Injection Molding Inc. Plastic Injection Molding, Inc. is a custom molder of plastic parts. We Produce parts for regional and international manufacturers including components for small tools, instrumentation, agricultural products, prosthetic components, consumer products, and others. Plastic Injection Molding, Inc. uses state of the art injection molding presses from 25 to 230 tons of clamp force and up to 20 ounces of material. Capabilities include consultation, part design, prototypes, mold construction, production molding, secondary operations, decoration, and assembly. 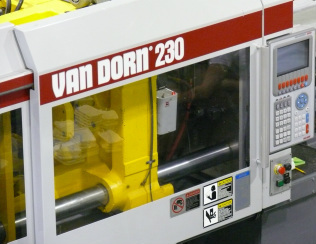 "In the 10 years of doing business with Plastic Injection Molding Inc. they have proven to be one of the most helpful and reliable vendors that we have had the opportunity to do business with. Their attention to detail and quick response time, when coupled with a dedication to high quality components has led to an extremely beneficial relationship for us here at Western Sintering Co. Inc. As a company where one of our core values is American-made products, Plastic Injection Molding Inc. fits the bill when looking for domestically sourced, high quality plastic components at a great value. If you have a need for plastic injection molded components I would highly recommend giving Ken Williams and his highly skilled and dedicated staff at Plastic Injection Molding Inc. an opportunity to win your business."